The author is engaged in studies of the ancient Eastern Mediterranean and Near East. He has performed research for Velikovsky on topics suggested by the latter, including the archaeology of Pylos and Gordion and the C14 tests on samples from the two sites. We are constantly assured that the chronology of Egypt from the time of the 18th Dynasty on is absolutely accurate with perhaps only 20 years uncertainty in a couple of places (1). The absolute dates obtained are founded on numerous texts of a historical nature inscribed on stone and written on hides and papyrus, on lists telling the order and regnal periods of the pharaohs, and on astronomical calculations for the position of the star Sothis during different reigns, the latter giving the precision of mathematics and science to the scheme. Since Egypt's dates are regarded as sound they are seized upon by archaeologists dealing with cultures in contact with Egypt which were either non-literate or whose writing is non-historical or still undeciphered. The absolute dates attached to finds in Greece for the Late Bronze (also called Late Helladic or Mycenaean) Age are thus derived directly from Egyptian ones. Once dates have been assigned to Greek material, exports of that material from Greece to other lands in turn furnish absolute dates to the places and strata in which they are encountered. This is especially true of the Mycenaean pottery of Greece which is quite distinctive and whose sequence has been established by experts noting stratigraphy of the finds and changes in shape and decoration. The absolute dates assigned to the various pottery phases depend on Egyptian chronology (2). When this pottery is found in Greece, in Near Eastern contexts, or in the West, it furnishes the absolute dates it acquired from Egypt. A system has thus been set up for Egypt, taken over by those working with cultures in contact with Egypt and then used for cultures in contact with cultures in contact with Egypt. Egypt is the key to this scheme. Dr. Velikovsky in the first volume of Ages in Chaos (1952, 223ff.) asserts that Pharaoh Akhnaton is misdated by over 500 years, and belongs in the 9th not 14th century B.C. If this is true, the Mycenaean pottery designated Myc. III A:2 I found in his capital (3) is likewise dated ca. 500 years too old, and whenever it appears in Greece, Crete, Asia, or the West the date it furnishes should be lowered appreciably. Velikovsky has amassed a great deal of evidence for his claim in the first volume of his work; in subsequent ones he promises to demonstrate the invalidity of the whole Egyptian system based on the kings' lists and astronomical calculations by pointing out the flaws, lacunae, duplications and contradictions in the lists and the erroneous assumptions made for the stellar arithmetic. The historical documents will be used in future volumes as they were in the first one to show that the true dates of their composition and the events they relate are much younger than those so unquestioningly accepted. There are physical means of determining dates for objects. These are not subject to the theories of historians but are impersonal and scientific. If understood and used properly they furnish unprejudiced dates. These depend upon the conversion of an unstable element to a stable one at a measurable rate, e.g., potassium to argon, uranium to lead, carbon14 to nitrogen14 (4). The radiocarbon method has been applied only very sparingly to Egyptian objects of the 18th-21st Dynasties (those of most concern to Velikovsky's revision of ancient history), because, for one thing, the system of absolute dates is assumed to be more accurate and have a smaller margin of error than the C14 method provides (5). Some carbon dates for short-lived samples from the tomb of Tutankhamon, a successor to Akhnaton, have already been published by Pensée (6), and as was stated, the results fit in perfectly with Velikovsky's, not the old, scheme. A few other C14 samples have been tested and reported. These "tend to be young" and are, in fact, from wooden planks and beams (7), the type of sample to be discussed in this article. One wonders how many more samples were tested yet never reported, especially in the light of the statement: "If a C14 date supports our theories, we put it in the main text. If it does not entirely contradict them, we put it in a foot-note. And if it is completely 'out of date,' we just drop it." This is called "a common attitude among archaeologists" (8). There are, of course, those cultures which came into contact with Egypt, and acquired their absolute dates therefrom, such as Crete, the Greek mainland, the Hittite sphere, etc. Precious few dates have been reported for them. (I hope to treat the results for the areas other than Greece elsewhere.) For the Mycenaean culture of Greece, we are told that the absolute dates, supplied by Egypt, are far more accurate than any that radiocarbon dating can provide (9), so for Late Helladic Greece only one site, to my knowledge, has had its Cl 4 dates reported. Near the modern town of Pylos in Messenia in the southwestern Peloponnesus, a Mycenaean palace and town, taken to be the ancient Pylos of which Homer sang, were uncovered. According to legend, Nestor, its aged king, fought in the Trojan War. Carl W. Blegen, the excavator of both Troy and Pylos, assigned absolute dates to a burned layer at the site of Hissarlik in Northwestern Turkey, which he assumed to represent the Greek destruction of King Priam's Troy, and to the palace of Nestor, also destroyed by fire. The absolute dates were furnished by Mycenaean pottery in and under both destructions, and as noted above, the pottery dates come from Egypt, so that if Velikovsky is correct and the Egyptian dates are centuries too old, then so are the dates of the pottery and the conflagrations. A great deal of archaeological evidence can be amassed for the burning of both Pylos and Troy to support dates centuries younger than those furnished by Egypt. Elsewhere I hope to treat both sites in detail, but the present article restricts itself mainly to a consideration of the C14 evidence. Blegen found Mycenaean pottery in the destruction layer of Pylos obviously representing "the ceramic shapes and styles that were in normal current use on the very day the palace was set afire and destroyed" (10). "The collection as a whole reflects chiefly the latest stage in the style of Mycenaean III B" but there were quite a few pieces belonging to the III C period (11). Arne Furumark set the transition from the one style to the other at ca. 1230 B.C., about the time of the death of Pharaoh Ramses II (12). Blegen revised this downward by about 30 years, setting the date of Pylos' destruction at ca. 1200 B.C. (13). In the debris of the palace he also found a great deal of pottery which was dated not by Egyptian criteria but on the internal evidence from Greece itself. This ware he ascribed to ca. 600 B.C. (14). Blegen saw that after the fire "the site was obviously abandoned and thenceforth left deserted" (15). To account for the mass of later pottery he acknowledged that ca. 600 B.C. "there was fairly widespread activity on the site" (16). This later pottery appeared in many rooms of the palace, often, in fact, in the same layer as the pottery dated 600 years older (17) so that the earlier sherds must have percolated up. In one case the later sherds were found together with the earlier ones in a layer "which rested on the stucco pavement of the court" and "unquestionably represents the latest phase of occupation of the palace." Since, by the accepted chronology, they are six centuries too young to have been in use "on the very day the palace was set afire and destroyed" (see note 10 above), they “must somehow have penetrated from above" (18) through however much dirt settled and vegetation grew over 600 years, then slipping through "a compact layer of smallish stones closely packed in blackish earth" (19) .15 - .25 m. thick, they finally forced their way into a .03 -.10 m. thick "clayey deposit" (see note 18 above), for how else could they have gotten there? Two sets of pottery are involved here: a group dating to the 7th century on internal grounds, and a group dating to the 13th century on external grounds—the time of Ramses II of Egypt, with whose scarabs Mycenaean III B and C pottery is found (20). Though the two groups were found together in the same strata, because of the supposed passage of 600 years, the "late Geometric" pottery was branded part of "an intrusive deposit" (21) and the Mycenaean was used as a dating criterion for the fire. Velikovsky promises (22) to demonstrate in a future volume that Ramses II reigned ca. 600 B.C., not in the 13th century B.C. This would solve a problem at Pylos. No pottery percolated. None "penetrated from above." The two styles were contemporaneous. Both were used in the palace before the fire and buried by the debris. We've seen the date Blegen assigned to the fire and how he reached it with the help of Egyptian chronology. What does the radiocarbon method tell us about Pylos? Pieces of charcoal were submitted to the C14 laboratory of the University of Pennsylvania for radiocarbon analysis. Ten samples were published (23). The conclusion reached by the lab was that "the C-14 dates calculated with the 5800 half-life value place all samples close to or earlier than 1200 B.C., the date estimated by Blegen and Rawson for the destruction of the site" (24). The dates ranged from 1176 ± 50 B.C. to 1638 ± 60 B.C. (25) (recently revised to ca, 1359 - 1852 B.C.) (26). These findings are hailed since they seem to confirm the archaeologists' date and thus the Egyptian chronology upon which it was based (27). How does this affect Velikovsky's reconstruction? As was initially stated, these results are valuable only if properly understood and properly used. Before proceeding further with the Pylos results, we shall make a brief sojourn at a place in Asia Minor famed for its intricate knot and its legendary King Midas with his golden touch. The site is Gordion, capital of the ancient Phrygian empire. The Phrygians are listed by Homer as allies of Troy (28) in the same war in which he says King Nestor of Pylos fought, so that if one believes Homer and if the Trojan War was fought in the 13th century B.C. (Blegen, again because of Mycenaean pottery, set the date at ca. 1260 B.C.) (29), their presence in Asia Minor if not their empire should extend back at least that far. "Their first archaeological traces, however, appear in the middle of the 8th century" B.C. (30). Unfortunately for Homeric studies, the Phrygians can't be pushed back by 500 years. Unfortunately as well for archaeologists deriving their dates from Egypt, Phrygian art and architecture cannot be pushed back either. As has been documented by Greenberg and Velikovsky (Pensée, winter, 1973, pp. 26-3 1), before Mycenaean Greece acquired absolute dates from Egypt (31), the Lion Gate at Mycenae, now dated to ca. 1250 B.C. (32), was seen as a Greek copy of Phrygian lion tombs and was thus dated to the 8th century B.C. At Gordion itself the relation between the Phrygian and Hittite strata, so painful to explain as topsy-turvy for proponents of the old chronological scheme, will be treated by Velikovsky in his volume dealing with Ramses II, where it will be shown to represent the true sequence of events, i.e., the material from the layer above is not older than the layer below. Finally there is the problem of the 8th century walls of the Phrygian Gate at Gordion, for "their closest parallel" architecturally is found "in the walls of the sixth city at Troy ... separated in time by five hundred years" with no "intermediate examples" known (33). The problems involving 500 years faced by Homeric scholars and the archaeologists for Phrygia and Gordion seem imposing indeed, but the reason we turned from Pylos to Gordion was to note a problem for the physicists. Samples of organic material unearthed at Gordion were carbon dated at the same time and by the same lab that tested the Pylos specimens and the results were published in the same articles that treated Pylos (34). Specimens of material with a short life-span (P-128: textiles, and P-134: food), and P-127 "the outer part [emphasis mine]" (35) of a "semi-unfinished log" (36) were "in reasonable agreement with the estimated archaeological date of 725 B.C." (37) for the tumulus in which they were discovered (38). But there were other samples from Gordion which required "additional processing and extra care." From each of these "several portions were processed" and the portions "counted several times" because they yielded "unexpectedly old dates" "not representative of the dates of construction of the structures" from which they came—in fact, these dates were "erroneously old" "by several hundred years" (39). Why were some samples "in reasonable agreement" with the archaeological date and others "erroneously old" "by several hundred years"? The tests, as noted, were carefully and repeatedly performed so that the samples, not the tests, must have been at fault. The first set of samples was from short-lived material and the outer part of a log, while the second set consisted solely of wood from constructional beams. An explanation for their "erroneously old C14 dates" was required. The wood was studied, the species of trees involved were determined, the growth rings measured and counted, and the answer finally became obvious. A " 'physical' problem" was now recognized and "emphasized": "only the outer growth layers of a tree will represent the time of the cutting of the tree and usually the date of construction of a building" (40. The second set of samples "could be inner wood and therefore may not date the building of the structures from which they came" (41). Some of the samples had been charred by fire, most consisted of "crumbling dry wood" from beams which had rotted away (42), one (43) came from a log that had been shaped and thus lost outer growth rings, and at least one (P-133), dating nearly 400 years too early, was "from a squared beam." The all-important "outergrowth layers" (44) were "removed in the shaping of this squared beam" (45). Fire, rot, and shaping (especially squaring) remove outer growth rings which are the essential element for dating the cutting of a tree. The trees here were centuries old before they were felled, so the inner wood "antedated the cutting of the trees by several hundred years" (46), two samples (P-353 and P-218) antedating the cutting by over 500 years (47). Since the rings were "exceptionally narrow" (48) the forces that removed the outer wood eliminated centuries of growth from consideration. R. Stuckenrath, Jr., who co-authored the 1962 Radiocarbon report treating Pylos and Gordion, more recently summarized thus: "Each growth ring of a tree is, for purposes of Carbon-14 dating, an entity representing only the period in which it was formed; hence in a two-hundred-year-old tree the pith should be two hundred years older than the outside ring. The date of the outside ring will be the date of the felling of the tree and, presumably, not far from the date of construction of the building." "When the carpenter squares the log and perhaps splits it to form two beams, he is removing the outer rings along the sides of the beams. As a result, when wood from old construction is sampled to provide radiocarbon dates, it makes considerable difference from where the sample is taken. And if there is eventually fire or rot . . . the problem of accurate dating becomes more involved." "When we are dealing with large trees or slow rates of growth, the carpenter can quite easily present us with a built-in error of several hundred years" (49) (See Fig. 2). At Gordion fire, rot, and the carpenter all removed outer rings, so the "physical problem" was solved. Now, having seen the Gordion dates, problem, and solution, we return to Pylos where the C14 dates "place all samples close to or earlier than 1200 B.C." (50). These samples were not of food and textiles. Like the second set of Gordion samples, they came exclusively from constructional beams. All were of charcoal. It was admitted that at least 4 of the 10 samples came from beams that were probably squared (51), and a fifth probably was of inner wood, whether or not it was squared (52). Blegen describes the palace as built in "the canonical Mycenaean manner with vertical chases and horizontal grooves for the heavy timbers of the wooden framework" (53). "Almost every wall" had "a substantial framework of heavy upright, horizontal and transverse timbers and beams" (54). "In several places in the Main Building of the palace" and in the Southwest Building, the impressions left in the walls from the timbers make it "likely that the wooden beams were nearly square in section" (55). The palace was "a half-timbered construction of stone and wood," many of the timbers being"apparently square in section" (56). "Many seem to have been as much as 0.25 m. to 0.30 m. broad and thick" (57). One of the C14 samples (P-326) came from a "substantial" wooden door jamb squared to perhaps 0.50 m. x 0.58 m. in cross-section (58). Quite possibly all the samples tested came from squared beams from very large trees. We are nowhere told the type of wood used or whether the rings here are also "exceptionally narrow." No one bothered to compute what the age of the trees involved, whatever their species (59), would have to be before such. huge timbers could be obtained. No one knows how much outer wood was planed off, although Kohler and Ralph "assume that a squared beam could have been fabricated from a tree at least 200 years old, from which 100 or more growth rings were removed in the process of shaping" (60) in order to explain 17th century B.C. dates. Perhaps the trees were very ancient, their rings extremely narrow and ,.several hundred years" were removed in the manner described by Stuckenrath. This is not the only consideration. Charcoal is "a good absorber" and can pick up "humic contamination" from the soil and thus needs to be treated with NAOH to offset this (61). Only 5 of the 10 samples were so treated (see below). Three of those untreated had rootlets from modern olive trees imbedded in them, "all visible ones removed" (62). At least two samples (63) came from a room containing a layer of oily black earth so acidic that it burned into, pitted, and seared stone blocks in a few places in the palace (64). Blegen attributes this to an oil spill 600 years after the fire (65). If the charcoal, "a good absorber," was contaminated by humic acid, later olive oil, or still later roots and the enzyme they secrete or any combination of these, this would completely throw off measurements—making the dates seem too young but still invalidating the results of the tests. The wooden beams, if not replacement material, came from trees felled at least 100 years before the fire (Blegen set the construction of the palace about 100 years before its destruction) (66). It is possible that over those 100 years the wood had begun to rot just as did the Gordion material over a much longer period of time. That might explain certain remodeling phases of the palace (67). If the wood rotted before the fire or the charcoal deteriorated over the millennia in which it was buried, or both, that would also remove more outer wood from dating considerations. The rotting and contamination factors are possible, the squaring of the beams from the evidence of wall impressions is "likely," but one thing is certain: at Pylos the palace was destroyed in a "holocaust" (68) which "consumed everything that was inflammable within it, and even melted gold ornaments into lumps and drops of metal" (69). This was such a "devastating fire" (70) it even melted brick and stone into "a solid mass . . . as hard as rock," so hard, in fact, that it "had to be chiseled and chopped out by sheer force" (71); in one room it converted two large pots "into a molten vitrified layer which ran over the whole floor" (72). Stones melted and disintegrated from the heat. Some of the charcoal samples came from incinerated beams in walls constructed of stones that were"burned into lime" (73). Every sample tested by the Pennsylvania laboratory was of charcoal produced by this intense fire. Not only wood but a huge quantity of stored olive oil fueled the flames (74) so that this must have been a real inferno. In addition to the possibility of rot and contamination, the likelihood of squaring of the beams which at Pylos just as at Gordion removed outer growth rings and "can quite easily present us with a built-in error of several hundred years" (75), there was a tremendous conflagration that destroyed still more outer growth rings, perhaps hundreds of them, leaving only inner wood as charcoal. Even without rot or contamination either the carpenter or the fire could have eradicated centuries of outer wood, and the two together probably did exactly that. In fact, the four samples acknowledged to come from large squared timbers, consisting of three beams perhaps "as much as 0.25 m. to 0.30 m. broad and thick" and one up to .50 m. x .58 m., were among the five not treated for humic contamination because the fire incinerated so much of the wood (i.e., the wood left after squaring) these samples "were too small for pretreatment with NAOH" (AJA 366 n.18). Many factors were not taken into account for Pylos' C14 dates, the most embarrassing of which must be those related to squared beams because the same lab tested the Gordion and Pylos samples at the same time, and published the results of both in the same reports. Once the significance of this "physical problem" was recognized and "emphasized" for one site it should have held no less importance for the other. Why did this not occur? In both cases the lab knew what results the C14 method was expected to produce in order to fit the excavators' predictions: 8th - 6th century dates for Gordion, 12th or earlier for Pylos. When R. S. Young, the excavator of Gordion, found 8th - 6th century pottery and other artifacts associated with his structures, the carbon dates were expected to match, and when found for the short-lived samples but not for the others, an explanation was needed. The wood from the second group was examined, its use noted, rings studied, growth rate postulated, species of trees determined, squaring and disintegration taken into account. When the excavator of Pylos found pots dated by Egyptian chronology to the 13th century at his site, the C14 method should have verified this (76), and when it appeared to, even though the same factors should have been taken into account for all squared beam samples, such was not done and all seems harmonious. Physics seems to confirm historical theory. But does it really? The charcoal samples from Pylos had the same origin as those from Gordion-stout constructional beams. Squaring alone could account for the carbon dates' being "erroneously old" by centuries. In addition, there is the possibility that disintegration, or contamination by humic acid, olive oil acid, and rootlets threw off the measurements, and the certainty that the beams were burned intensely, losing still more outer rings perhaps hundreds of them—before leaving the pieces of charcoal that Blegen found. Quite recently Mrs. Ralph co-authored an article (see note 7 above) in which she acknowledged the problem of " 'long-lived' samples, such as supporting timbers" which could be "several hundred years" old, and the problem of charcoal which could come "from trees which were up to several hundred years old when felled." In both cases "radiocarbon dates of these samples should exceed the archaeologically determined ones" (pp. 112-13). At Pylos the two problems are compounded since we have charcoal from squared supporting timbers. Only such unreliable samples as these came from Nestor's palace. The dates they furnish tell us only when the trees were still alive and growing, not when they were felled, which, just as at Gordion, was probably centuries later. Before leaving the area, however, let us travel only 9 km. south of the palace to Osmanaga Lagoon at the head of Navarino Bay on Messenia's west coast, and we will find the kind of sample termed "ideal" by Kohler and Ralph (77), because, unlike mammoth trees, its life span is so very short. When pollen grains annually produced by flowering vegetation in the area around Pylos are dispersed by the wind, and land on the lake's surface, they "become waterlogged, and settle to the bottom, where they are buried by sediment" (78). This process has occurred for thousands of years. Two cores of the lake bottom were taken, the pollen identified and the stratified levels carbon-dated (79). We will concern ourselves only with the olive pollen from the lake since it has been generally agreed that intensive olive cultivation was practiced by Late Helladic Greeks, and the storage and export of oil was a major economic activity for them. In Mycenaean times "olive oil, for which there is both archaeological and written evidence—the latter recording large quantities—must have been one of the most important sources of wealth" (80). Pylos must have been wealthy indeed to judge by the numerous references to olive oil in the palace archives (81) and the "vast supplies of olive oil" stored in the oil magazines (82). There were at least five rooms inside the palace used to store the oil (83), and a large olive press for producing oil was also uncovered (84). The rulers of Pylos were very much concerned with olive oil. In addition, it appears that "there was a real 'population explosion' during (and perhaps partly as a result of) the political consolidation under the Neleids in the thirteenth century B.C." (85) in Messenia, and it was then "more densely populated than almost any other part of Greece" (86). The Pylian kings could thus draw upon a large labor force to tend to the trees and produce the oil. With these facts in mind "one might expect extensive olive cultivation to mark the time of high population and a vigorous economy, such as the time of the zenith in the thirteenth century B.C." (87) and expect that this "was one of the major agricultural activities of the Mycenaeans" (88). The palynological study performed by Professor Wright of Minnesota indicated that "the high value of olive pollen" "(more than 40 percent [compared to 35% today]) must reflect extensive olive orchards . . . The alluvial fans and slopes bordering Osmanaga Lagoon on the north and east must have been covered with olive trees, as they are today." Rather than providing absolute dates within the Mycenaean period (1550 - 1200 B.C. ), however, the "radiocarbon dates place the olive maximum at about 1100 - 700 B.C . . . when the population and political importance of southwest Peloponnese was much reduced compared to both earlier and later times." For the accepted time of the Mycenaeans (i.e., prior to the absolute date of 1100 B.C.) he detected "low values of olive pollen" (89), in fact, only "a modest amount" (90). An "ideal" sample placed the olive maximum during the Dark Age when it was totally unexpected (see below) and showed practically nothing for the period when it was expected. Wright despaired at these results and sought an explanation. The trees that produced the "vast supplies of olive oil" in Nestor's palace must have been miles from the lagoon since "olive pollen travels in quantity far from its source." Where were they? Rather than have this rich area around the lagoon totally uncultivated by the Mycenaeans, Wright postulated that it was used for other crops which unfortunately left "a poor pollen record." He rejected the possibility that pollen from wild rather than domesticated olives was represented in the core for 1100 - 700 B.C. because the percent of pollen was too high (91). He also rejected the possibility that if the trees were cultivated here during the Mycenaean period (and where is the pollen to prove it?) they could propagate, themselves produce that much pollen, or indeed find it easy to survive if left unattended. Someone was tending those trees. He looked for organic sources of contamination to explain away the unexpected carbon dates. He found none. He checked for inorganic sources and again found none (92). He learned that the results were not an isolated phenomenon for the Pylos region anyway, since a core from Lake Voulkaria near the Ambracian Gulf, well over 200 km. to the northwest, also showed that "the rise of olive pollen follows the Mycenaean interval, lending support to the hypothesis that olive was not introduced into Greece as a major food crop until after Mycenaean time" (93). He checked for laboratory error but concluded "there is no reason to suspect" any; "all six dates" from the Osmanaga core, ranging from modern to ca. 2000 B.C. "are at least in the correct chronological order" as determined by the layering of the sediment. "Other explanations might be that the radiocarbon dating is not accurate, or that the archaeological dating of the Mycenaean period is incorrect. An error in archaeological dating as large as 300 years seems unlikely." "It is possible that the radiocarbon time scale is not the true time scale" since the C14 produced in the atmosphere "may not have been constant" (94). He was forced either to doubt the Cl 4 dating or to accept "the likeliest explanation" (95) that little if any olive cultivation occurred here during the Mycenaean period (96). He chose to believe the latter. According to Wright, "during the unstable years after the end of the Mycenaean period" (97), the so-called Dark Age "of presumed cultural degeneracy. . that has left such a lean archaeological record in Greece" (98), when the area "was only extremely thinly populated" (99), hungry squatters, numbering "scarcely more" than 10% of the 13th century population (100) grew olives as a subsistence crop (101), for how could "an error in archaeological dating as large as 300 years" occur? Wright, with the results of his pollen analysis in hand, convinced that during the Greek Dark Age olive production was at a peak, reviewed a theory recently proposed by Rhys Carpenter that the Dark Age, which he called "a gap of emptiness wide enough to engulf any bridge that you might try to build from the pre-Hellenic [i.e., Mycenaean] to the Hellenic world" (102), was caused by drought (103). Wright, as director of the Limnological Research Center of the University of Minnesota, has "long specialized on the pollen, lake-level and geomorphological evidence about which he writes, with special reference to Rhys Carpenter's Discontinuity in Greek Civilization" (104) and according to him the olive record disproves that theory (105). Long before Carpenter expressed his view, in fact, 30 years ago, Axel Persson noted what he considered to be the "particularly widespread" "use of oil lamps" in the Mycenaean Age and again in post-Dark Age Greece with none in between to bridge the Dark Age. He commented: "It may well be asked what caused the disappearance of the true lamp with the downfall of the Minoan-Mycenaean civilization" (106). He suggested that a climatic change may have disrupted olive production (107). Wright shows that the olives not only grew then but flourished. Dark Age lamps even after 30 years of continue excavations, however, still haven't turned up (108). There are then two problems: where did the oil come from in Nestor's palace if not from trees somewhere near Osmanaga Lagoon, and where are the lamps representing the time that olive production was at a peak? We must also ask ourselves if the Mycenaean rulers of Pylos neglected olive production when all the archaeological and inscriptional evidence shows how concerned they were with it, and if it is likely that "olive was not introduced into Greece as a major food [or oil-producing] crop until after Mycenaean time" when Dark Age squatters decided to perform such intensive agricultural production. Velikovsky's readers have seen that he pulls down the beginning of the 18th Egyptian dynasty to the 11th century B.C., and since the Late Helladic period's inception is synchronized with this, it too comes down by over 500 years, eliminating the unbridgeable gap of the Dark Age (109). There is no problem with the lack of Dark Age lamps, as there was no Dark Age. The lamps called "Mycenaean" are contemporary with the olive peak. There is no problem with the results of the pollen analysis: the olives were planted at or slightly before the beginning of the Mycenaean Age in the 11th century B.C. and flourished until the palace burned down in the 7th century B.C. (110). In summation we have touched briefly upon some archaeological problems at Pylos and Gordion and saw 500 - 600 year discrepancies in both. We studied the C14 dates for the Pylos samples and then for the Gordion ones of the same type to show that despite Pylos' results being "close to or earlier than 1200 B.C.," the samples, being of long-living matter are unreliable, especially considering the squaring and incineration of the beams. We looked at very short-lived material from the Pylos region, the "ideal" type for tests, and noted problems for the old scheme, confirmation for the new. More C14 dates are needed for "Late Bronze Age" Egypt, Greece, and other regions, more from short-lived material, preferably from archaeological rather than geological contexts. Admittedly they will be hard, perhaps impossible, to find in a burned palace, but there are many tombs that may offer samples. (Thermoluminescence tests on the pottery from the palace, however, would serve to date the fire.) Many more short-lived samples need to be found, tested, and the results published for all to see whether the dates derived by physical means fit in best with the old scheme or the new. (1) See for example T. Säve-Söderbergh and I. U. Olsson, "C14 dating and Egyptian chronology," Radiocarbon Variations and Absolute Chronology, I. U. Olsson, ed. (Stockholm, 1970) p 35ff., especially p. 38. (2) A. Furumark, The Chronology of Mycenaean Pottery (Stockholm, 1941), especially pp. 110-115. (4) Certain assumptions are made for these methods by the physicists. See articles by York, Velikovsky, and Wright in Pensée (May, 1972), 18-21. (5) In fact, see Radiocarbon Variations, op. cit., pp. 35-55, where we are told that the carbon dates ought to be made to conform with the Egyptian absolute dates, not vice versa (p. 55). (7) H. N. Michael and Ralph, "Correction factors applied to Egyptian radiocarbon dates from the era before Christ," Radiocarbon Variations. op. cit., p. 117; see pp. 112-13 for a discussion of the problem of old wood. (8) The quotation, referring specifically to Egyptian samples, was made by Professor Brew. It is cited with comments by Säve-Söderbergh and Olsson, op. cit., p. 35. (10) C. W. Blegen, The Mycenaean Age, The Trojan War, The Dorian Invasion, and Other Problems (Cincinnati, Ohio, 1962), p. 18. 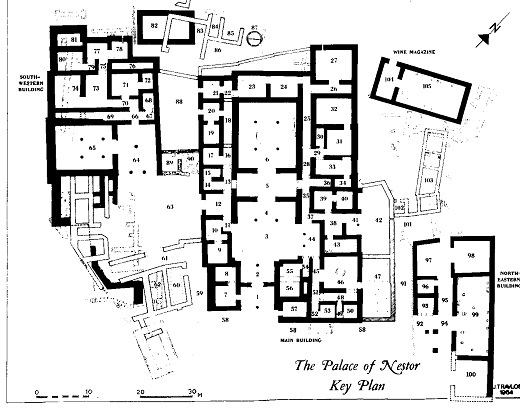 (11) C. W. Blegen and M. Rawson, The Palace of Nestor at Pylos in Western Messenia (henceforth PN), vol. I (Princeton, 1966), p. 421. (12) Furumark, op. cit., 115. (13) PN 421, S. E. Iakovides, Perati, vol. B (Athens, 1970), p. 468, brings down the date a bit further. The evidence for reducing the date is not at all secure, and, if anything, the change now seems to me to have preceded Ramses' death. (14) In "The Palace of Nestor Excavations of 1956," American Journal of Archaeology, 61 (1957), 130, Blegen cautiously said, "perhaps of the seventh century B.C." but see PN 177, 184 for his most recent view. He constantly called these sherds "late Geometric" (PN 64, 175, 229, 294-6, 300, 329, 332 and see AJA 1957, p. 130). More recent analysis by J. N. Coldstream, Greek Geometric Pottery (London, 1968), p. 330, established ca. 750-680 B.C. as the limits for the Late Geometric phase in this area, but Coldstream seems unsure whether Blegen's finds are "late Geometric" (408)—either the term is incorrect in the light of this more recent analysis or the pottery precedes 680 B.C. (17) PN 181, 184, 185, 294, 300, 303. (19) AJA (1957), p. 130. Above the black layer the earth was plowed (PN 294) and much disturbed (AJA, 1957, p. 131) and there is a discrepancy whether the black layer was "immediately below the surface" (AJA 130) or under "a stratum of plowed earth, ca. 0.15 m. deep" (PN 294) or if the two descriptions mean the same thing. This being the case, especially since the surface down to perhaps .15 m. was disturbed (PN 294. AJA 131) it would be difficult to say how much dirt would settle and vegetation grow over the 600 years (see PN 422 for vegetation growth) but one would expect both processes to have occurred if 600 years really did transpire. The small stones in the black layer were presumably from the collapse of rubble walls within the palace (PN 177). Such walls would most certainly have fallen at or soon after the time of the fire, not standing six centuries to topple onto later pottery. (20) Furumark, op. cit., pp. 114-15 Iakovides, Perati, vol. A (1969), pp. 166, 382: vol. B (1970), pp. 467-68. (22) I. Velikovsky, "Theses for the Reconstruction of Ancient History," Scripta Academica Hierosolymitana (N.Y., 1945), Theses 172, 206,240,245. (23) E. L. Kohler and E. K. Ralph, "C-14 Dates for Sites in the Mediterranean Area," AJA, 65, 1961 (henceforth AJA), 366-67; E. K. Ralph and R. Stuckenrath, Jr., "University of Pennsylvania Radiocarbon Dates V," Radiocarbon, 4, 1962 (henceforth RC), 150-51. (26) Letter from E. K. Ralph to S. Talbott (Jan. 8. 1973). (27) See for example S. Piggott, Ancient Europe (Chicago, 1965), p. 159. (28) Iliad, II, 862-3. And see III, 184-89. (30) E. Akurgal, Ancient Civilizations and Ruins of Turkey (Istanbul, 1970), p. 14. Earlier (Chronologie der Phrygischen Kunst," Anatolia, 4. 1959, 119-20) he wanted to push them back a bit further, but at no time has he placed them prior to ca. 800 B.C. His most recent opinion (1970) puts them ca. 750. (31) P. Demargne, Aegean Art: The Origins of Greek Art, translated by S. Gilbert and J. Emmons (London, 1964), pp. 8, 281, shows how Mycenaean dates, unlike Phrygian ones, could be and were pushed back by 500 - 700 years from the first millennium B.C. dates arrived at by several late 19th century scholars, and gives the clue why there is a dark age for Greece. (32) G. E. Mylonas, Mycenae: A Guide to Its Ruins and Its History, 3rd edition (Athens, 1972), p. 17. (33) R. S. Young, "Gordion: Preliminary Report, 1953," AJA, 59 (1955), 13; and see "Summary of Archaeological Work in Turkey in 1953," Anatolian Studies, No. 4 (1954), 16, and R. S. Young, "The Nomadic Impact: Gordion" in Dark Ages and Nomads etc., edited by M. J. Mettink (Leiden, 1964), p. 52. 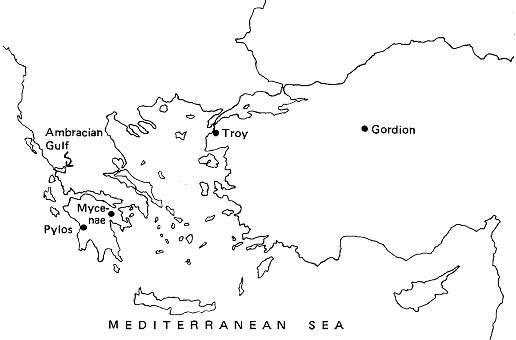 Blegen, Troy and the Trojans, noted that Troy VI was destroyed by earthquake (p. 144) and because of the type of Mycenaean pottery present in the debris, he dated this to 1300 B.C. (pp. 141-2, 174). (34) See note 23 above. (36) AJA 363. The accounts seem garbled. RC 148 calls the log "unfinished" while AJA 361 says the tree was shaped and outer growth rings were removed. The RC account calls this a sample from the "outer part" of the log, while the AJA 363 account calls this an "outer" log (from the outer wall of the structure?). (38) The dates are: food 752 ± 122 B.C., textiles 778 ± 94 B.C., and wood 851 ± 94 B.C. The 100-year discrepancy with the wood is easily explained, especially with reference to what will follow in this paper, since "recent examinations of the tree-ring pattern of this log have revealed that some shaping of the log was performed which may have removed approximately 100 growth rings" (AJA 361). (43) P-127. See notes 35 and 36 above. (44) See note 40 above. (49) R. Stuckenrath, Jr., "On the Care and Feeding of Radiocarbon Dates," Archaeology, 18 (1965), 281. (51) Loc. cit. It is said that the beams "had possibly been squared," but from Blegen's account (see below) it seems highly likely that they were indeed squared—in fact all 10 may have been. (58) This is the measurement of the stone base upon which it stood. PN 209, n. 69. (59) It would be of great interest to learn whether the trees were cypress or the slowgrowing oak. From a study of pollen, another aspect of which will be treated shortly, it is apparent that "there was practically no pine left" in the region of Pylos by Mycenaean times and cypress trees and oak forests are postulated (Minnesota Messenia Expedition [henceforth MME I, edited by W. A. McDonald and G. R. Rapp, Jr., Minneapolis, 1972, pp. 193, 246-7). Oaks can grow very old before cutting and it is claimed that "many of the ancient oaks that remain in England may date from Saxon times" ("Oak," Encyclopaedia Britannica, 14th edition, 1930, vol. 16, p. 659). (64) PN 177, 180, 184, 296. (65) He bases this on the abundance of "later" sherds in the layer—sherds which probably are not later—, but if he's right, the oil, itself organic matter, should yield a carbon date 600 years younger than the date of the fire. (74) PN 10, 171, 199, etc. (75) See note 49 above. (76) Young decided that Hittite pottery 500 and more years too old at Gordion was an intrusive element. Blegen made the same decision for pots 600 years too young at Pylos and only considered the Mycenaean pottery for dating purposes. These 500-600 year "intrusions" should be of especial interest to readers of Ages in Chaos. (78) H. E. Wright, Jr., "Vegetation History," MME 189. (79) For the method see MME 189 ff. (80) Taylour, op. cit., p. 126. (81) Loc. cit. for "large quantities" recorded. J. Chadwick ("The Mycenaean Documents," MME 115) says "olive oil is amply attested on the tablets." Wright (MME 195) says "the Pylos tablets refer repeatedly to olive oil." E. L. Bennett, Jr. (The Olive Oil Tablets of Pylos, Madrid 958 [Supplement 2 to Minos]) interprets all of these references as small quantities of scented oil for religious purposes (37). He admits that there is a "real possibility of misinterpretation" and his view may be "misguided" (38) but even if he is correct, there is ample physical evidence for a great concern for and a vast storage of olive oil (see below). (82) Taylour, op. cit., p. 96; and see MME 195 and PN passim. (84) Rooms 89 and 90. Blegen (PN 295-98) attributes the press to the period 600 years after the fire because of the 7th century sherds found in it, but for a number of reasons, both the press and the sherds seem to predate the fire, probably belonging to a later phase of construction during the palatial period. The gigantic oil spill encountered throughout the palace seems to represent the unburned residue of the stored oil in the palace, not a 600-year later spill. (85) W. A. McDonald and R. Hope Simpson, "Archaeological Exploration," MME 141. They believe part of the increase may have been due to an influx of foreign slaves. Neleus was the father of Nestor. The dynasty he founded, the 'Neleids,' ruled at Pylos (according to Pausanias) until the so-called Dorian Invasion. See PN 423 where Blegen connects the different events in the history of the palace with the legends about Neleus, Nestor, etc. (86) BIMN, Mycenaean Age, op. cit., p. 9. (88) H. E. Wright, Jr., "Climatic Change in Mycenaean Greece," Antiquity, 42 (1968), 126. (90) W. A. McDonald and G. R. Rapp, Jr., "Perspectives," MME 246. (93) MME 199 and see 249-50. (96) The "low values" for Mycenaean times might represent wild olive. (98) Wright, Antiquity, op. cit., p. 126. (99) V. R. d'A. Desborough, The Last Mycenaeans and Their Successors (Oxford, 1964), 234. (101) MME 195-6 and see 143. (102) R. Carpenter, Discontinuity in Greek Civilization (Cambridge, England, 1966), p. 35. (103) Ibid., passim. ; B. Bell, "The Dark Ages in Ancient History, I, The First Dark Age in Egypt,"AJA (1971), 75 accepts the theory. (104) Editor's note preceding Wright's Antiquity article (p. 123). (105) Wright, Antiquity, op. cit., 123-6; MME 40, 196, and see 251. (106) A. W. Persson, New Tombs at Dendra Near Midea (Lund, 1943), p. 109. (108) See R. H. Howland, The Athenian Agora IV: Greek Lamps and Their Survivals (Princeton, 1958), p. 7; G. S. Kirk, The Language and Background of Homer (1964), 181; A, M. Snodgrass, The Dark Age of Greece (Edinburgh, 1971), P. 394. (109) Two books on the topic, A. M. Snodgrass' The Dark Age of Greece (Edinburgh, 1971) and V. R. d'A. Desborough's The Greek Dark Ages (London, 1972), have come out quite recently. Neither treats the matter as a chronological problem and both are thus left with unanswered questions and seemingly insuperable problems. Velikovsky (1945, op. cit., Theses 106-12) saw the problem and how to solve it nearly 30 years ago. At a future date I hope to treat this subject in great detail. (110) Blegen sees the site of the palace occupied from before the beginning of the Mycenaean Age (PN 31-33) and "surrounded by a circuit wall in the sixteenth [by the new scheme the 11th] century" (32). The problem of dating the "late Geometric" pottery in the palace which should tell us the date of the fire was already discussed (note 14), but it should fall sometime between 750 - 600 B.C. The dates for the olive peak were originally given as 1000 - 600 B.C. (Wright, Antiquity, op. cit., P. 126). Why this was changed to 1100 - 700 (MME 195) is not explained. It may be hoping for too much but it would be of great interest to learn if a layer of ash was detected in the cores for a date in the 7th century, the time here proposed for the conflagration of the palace (I do not follow Blegen's interpretation of invaders burning the site). It is possible that ash from the conflagration was blown onto the lagoon as was olive pollen. <See Velikovsky's "Astronomy and Chronology in this issue. Ed. After completing this article, the author found references to a few more Mycenaean C14 dates which he will treat separately in a short article in a subsequent issue of Pensée.